42 out of the 84 Siemens Gamesa 7MW wind turbines have been installed on the 588MW Beatrice wind farm offshore Scotland, Swire Blue Ocean said. 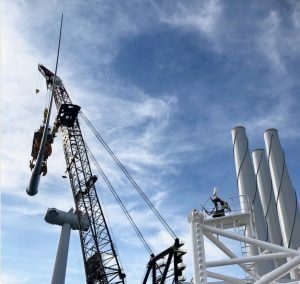 Forty wind turbines have been installed at the Beatrice offshore wind farm and the project is now two turbines away from reaching a halfway mark. 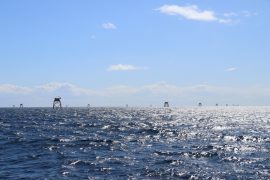 BMO Offshore has won a new framework contract with SSE to deploy vessel monitor measurement systems on the Beatrice offshore wind farm. 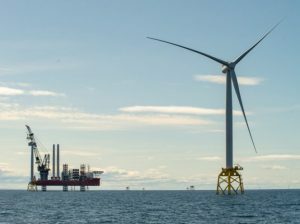 A third of wind turbines has now been installed on the 588MW Beatrice offshore wind farm in the Outer Moray Firth, Scotland, Beatrice Offshore Windfarm Limited (BOWL) said. 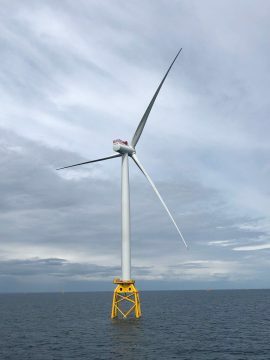 Swire Blue Ocean’s Pacific Orca has installed 20 out of 84 Siemens Gamesa 7MW turbines at the Beatrice offshore wind farm in the Outer Moray Firth, Scotland. 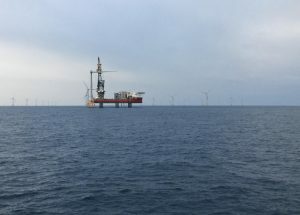 Siem Offshore Contractors has completed the inter-array cable installation at the Beatrice offshore wind farm site, according to Beatrice Offshore Windfarm Limited’s (BOWL) social media post from 21 August. Nine Siemens Gamesa 7MW wind turbines have so far been installed on the 588MW Beatrice offshore wind farm in the Outer Moray Firth, Scotland, Beatrice Offshore Windfarm Limited (BOWL) said. 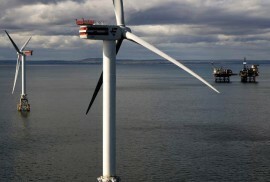 Scotland’s largest offshore wind farm, the 588MW Beatrice, has started generating power for the first time. 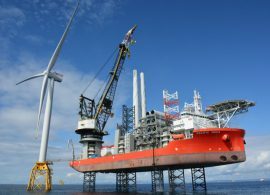 Swire Blue Ocean’s jack-up vessel Pacific Orca has installed the first of the total of 84 Siemens Gamesa 7MW wind turbines at the Beatrice offshore wind farm site in the Outer Moray Firth, Scotland. 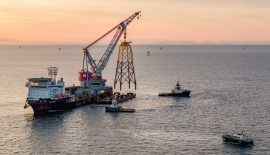 Seaway Heavy Lifting’s vessel Oleg Strashnov has installed the 86th and final jacket foundation on the Beatrice offshore wind farm in the Outer Moray Firth, Scotland. 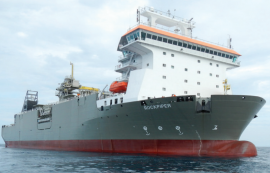 Seaway Heavy Lifting (SHL), using its vessel Oleg Strashnov, installed the 77th jacket foundation at the Beatrice site on 20 June, according to some media posts from those involved in the project, following the project’s Notice to Mariners from 18 June that reported 76 jackets being in place. 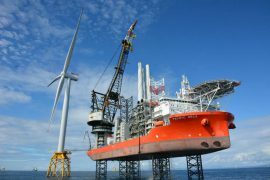 The EC1 export cable and the OTM1 offshore transmission module at the Beatrice site will come under the control of the SSE Operational Safety Rules on 30 May, after which they will be energised, most likely on 1 June, according to the latest updates from the project’s Notice to Mariners. 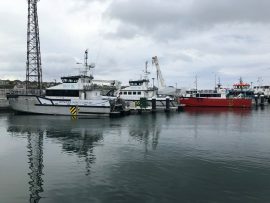 Crown Estate Scotland today (21 May) unveiled its proposals for leasing seabed for new offshore wind projects that would be built in Scotland’s waters from late 2020s onwards. Nexans has completed all export cable installation and burial works at the Beatrice site, where Siemens Transmission and Distribution team has started commissioning works on the recently installed second Offshore Transformer Module (OTM) in preparation for the energisation of the system. Seaway Heavy Lifting has installed 56 out of the 86 jacket foundations on the Beatrice Offshore wind farm in the Outer Moray Firth, Scotland, Beatrice Offshore Windfarm Limited (BOWL), said. Seaway Heavy Lifting’s heavy lift vessel Oleg Strashnov has installed the jacket foundation for the second Offshore Transformer Module (OTM) on the Beatrice offshore wind farm in the Outer Moray Firth, Scotland. 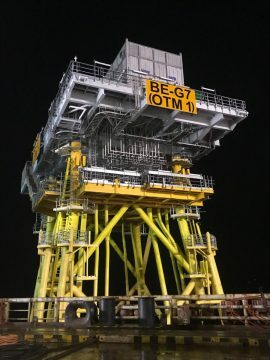 The installation of the first Beatrice Offshore Transformer Module (OTM) has been completed with the OTM 1 topside now placed on its jacket foundation that was installed earlier this month. 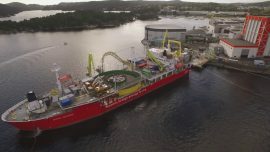 The first section of the second export cable which will connect the Beatrice offshore wind farm to the Scottish grid arrived in Peterhead on Monday, 29 January, Beatrice Offshore Windfarm Limited (BOWL) said. 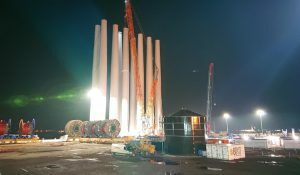 The rock emplacement campaign for the installation of the first of two export cables in the Beatrice offshore wind farm export corridors and construction site started on 25 December, Beatrice Offshore Windfarm Limited (BOWL) said in a construction update report.